The X-Men have faced many dastardly villains over the years, including Apocalypse, the Sentinels, Sebastian Shaw, Dark Phoenix, and of course their frequent arch-nemesis Magneto. Hugh Jackman's Wolverine has been a mainstay of that superhero franchise for an impressive 16 years, and he'll finally be hanging up his adamantium claws for a well-deserved retirement after one final film, the 2017 sequel Logan . 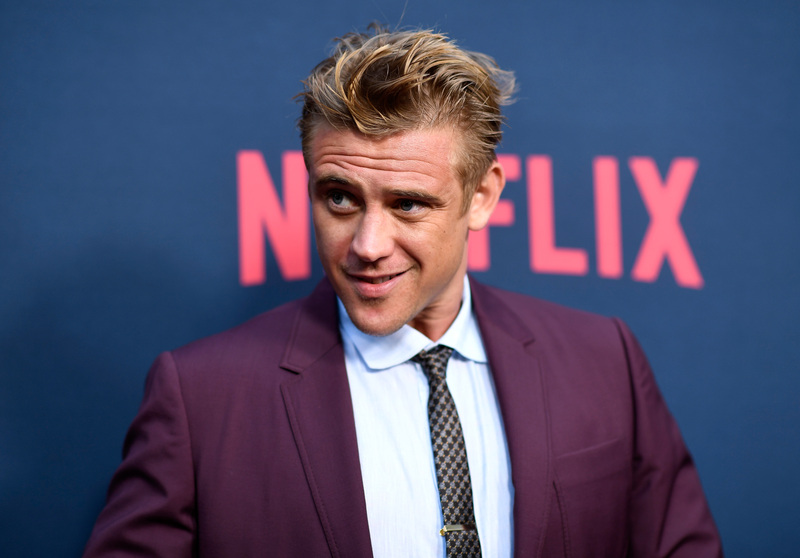 We already knew that actor Boyd Holbrook (Narcos, Gone Girl) would be playing that film's chief baddie — but now we know who the villain is, courtesy of the movie's official Instagram. The question fans everywhere are probably asking right about now is: Who is Donald Pierce? The reveal came in the form a black-and-white picture showing Holbrook presumably in character, bearing the simple one-word caption "Pierce." In the comic books, Donald Pierce is a villainous half-man-half-cyborg technological genius who works as the CEO Pierce Consolidated Mining when he's not pursuing his sole purpose in life: to kill as many mutants as possible. Introduced on the page in a 1980 issue of The Uncanny X-Men, Pierce would go on to tangle with the superpowered group over the years, occasionally as a member of the Hellfire Club (the group of baddies seen in X-Men: First Class), including frequent run-ins with Wolverine. At one point, Pierce captured Logan and proceeded to torture and even crucify him before the mutant was rescued. This revelation fits with one of the things we already knew about the film — namely, that the Reavers would play a significant role. In the comics, the Reavers are a group of cyborg assassins manufactured by Pierce to help him hunt down and murder mutants; so it would make sense that their creator would also be making an appearance. However, what's most interesting about the news is the ways that Pierce doesn't fit with what we know about Logan . First of all, when Holbrook's casting as the film's "lead villain" was first announced, Deadline reported that he would play "a relentless, calculating and intense head of security for a global enterprise." That "global enterprise" is presumably the Essex Corporation, as teased in the X-Men: Apocalypse post-credit scene earlier this summer. But Pierce was never a head of security, and he definitely never worked for Essex. Secondly, it's widely known that Logan will be based in part on the famous "Old Man Logan" storyline from 2008, which finds an aged Wolverine fighting through a post-apocalyptic landscape ruled over by several of Marvel's most famous villains, in which most of this fellow X-Men have been wiped out. Although those villains include the likes of Dr. Doom, Red Skull, Abomination, and Magneto, Donald Pierce is not among them; in fact, he plays no role whatsoever in "Old Man Logan." Finally, there's the fact that Apocalypse director Bryan Singer confirmed that major X-Men villain Mister Sinister would appear in Wolverine 3 , the character's first onscreen appearance in a live action film. (Mister Sinister's real name is Nathaniel Essex — as in Essex Corp.) But reports of Holbrook's casting hold him forth as Logan's "lead villain." Would Mister Sinister really make his much-anticipated feature film debut only to play second fiddle to a little-known cyborg? Not everything is adding up quite yet when it comes to Logan and its villainous characters. It's clear that there's much yet to be revealed in advance of the film's March 2017 premiere… but then again, that's half the fun, right?